Bladder diverticulum, a herniation of the bladder mucosa, occurs through a weak point of a hypertrophied muscular wall caused by bladder outlet obstruction. Bladder diverticula can be congenital but, more frequently, are acquired. The diverticulum wall includes an inner mucosal layer and an outer fibrous reactive layer. In 1922 Geraghty demonstrated that removing the mucosal layer was sufficient to obliterate the cavity delimited by the fibrous layer. The surgical approach can be extraperitoneal, transperitoneal, or transvesical. The transvesical laparoscopic removal of the inner mucosal layer, followed by intracorpo-real suturing of diverticulum neck represents a definite advantage, with a very limited trauma to the patient. The first report about laparoscopic bladder diverticulectomy dates back to 1992 when Raul Parra (3) reported the first case. 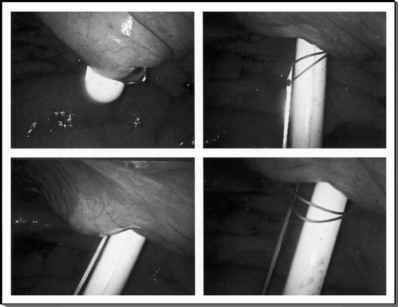 The case was done transperitoneally and the opening in the bladder wall was closed with two successive firings of endostaplers under transurethral endoscopic control. In the following years a few other reports of anecdotal cases have been reported and the surgical technique was always transperitoneal. In 1994 Nadler and Clayman (7) reported the first extraperitoneal laparoscopic diverticulectomy using a technique popularized years later for the extraperitoneal approach for laparoscopic radical prostatectomy. Iselin (9) in 1996 and Porpiglia (12) in 2002 addressed the problem of the timing of transurethral resection of the prostate and transperitoneal diverticulectomy stating, although with a limited number of patients, that the two procedures could safely be performed in the same setting. The literature shows that laparoscopic bladder divertic-ulectomy can easily be performed, either through the transperitoneal or extraperitoneal approach, but the limited number of patients with this pathology does not allow to have significant data.